Thanks to all the holiday sales, my now depleted cabinet of bath supplies has now been restocked! I love me some holiday sales, too bad my wallet hates them. But that’s okay, because in the end, I smell really, really good so my friends, coworkers, and cast mates love me! So onto one of Bath & Body Works new lines, Be Enchanted! The Application: I tend to love B&BW’s cream lotions, especially in the winter time. They are thicker and highly moisturizing. I cannot stand the feel of dry skin and find myself moisturizing all day long during the fall and winter. Go on OCD! So on one of the coldest nights of this winter so far, I grabbed Be Enchanted from my cabinet and gave it a whirl. Be Enchanted went on smoothly though the consistency did remind me a little of whipped frosting as it was very airy rather than being a straight up thick cream. That’s okay, I can roll like that as longs as it moisturizes, and it did! The Verdict: I’ve got to be honest, Be Enchanted is not my favorite scent of B&BW. I guess I have an issue with smelling like a Sweet Tart, much like the candy at the bottom of your Halloween bag after all the good stuff is gone, I’m just not that interested. In the end, the scent just wasn’t very pleasing though the moisturizing power was definitely there. Body chemistry also may also play a big part when it comes to this fragrance, so maybe Be Enchanted just doesn’t play well with this girl! Though, the bottle is very cute in an ultra girly way if that’s’ the way you roll. The holiday season is here, so I needed some holiday hand cleaning cheer to put me in the mood. Okay, the tree, the music and the holiday goodies I’ve been making in the middle of the night to break up my studying for finals were more than enough to put me into the holiday cheer, I just needed an intro. Moving forward! Vanilla Bean Noel Deep Cleansing Hand Soap ! The Application: I usually love the ease that comes with using B&BW hand soaps, especially the foam ones. For some reason, I thought I had bought the foaming Vanilla Bean Noel Hand Soap, but it turns out I bought the regular soap which means I have to put a little bit more effort into hand washing. Even reading that sentence makes me realize how sad that sounds, but I have a really busy schedule and love the hand foam ease! In the end, it was easy enough to get a good lather from the soap, my issue was more with the little blue beads that were thrown into the mix. They are really, really small, but I don’t like having to deal with them. Why are they there? For decoration, extra scrubbing power, or do they have some sort of moisturizing powers? If you’re looking for an answer, you won’t find it here. All I can tell you is they are there and I don’t love them. Though, they are pretty harmless in the long run. The Scent: Well with the name Vanilla Bean Noel, I think you get the scent. Yeah, it’s vanilla! In theory, that is a great thing. I LOVE anything vanilla, especially when the product actually smells like vanilla. Vanilla Bean Noel misses the mark. When scrubbing my hands, I don’t smell a damn thing. 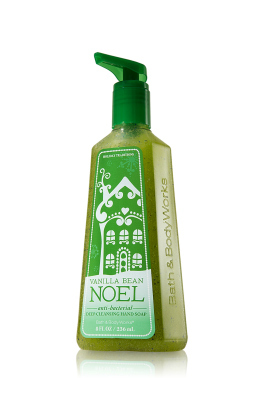 Usually, B&BW makes their soaps pretty strong when it comes to scent, but with Vanilla Bean Noel I never got one whiff of vanilla. In fact, it smelled like absolutely nothing. How is that possible? I know, just more unanswered questions. The Verdict: Yeah, no. Not going to buy Vanilla Bean Noel again, at least not this version of it. Maybe I bought a defective bottle, or maybe the Deep Cleansing Hand version just stinks! Or in this case, doesn’t stink enough. Either way, I’ll be passing on this one in the future. I finally moved onto another hand soap. Actually, I have been using it for a few weeks, but kept forgetting about. Finally, after a crazy week, I am able to post a few things. Ah, you crazy life! Onto Fresh Picked Strawberries! The Scent: Fresh Picked Strawberries is a fresh fruity scent that will be sure to please those who love the freshness of fruit. The thing about B&BW is that when it comes to hand soap scents, they don’t mess around! Fresh Picked Strawberries is no exception and packs quite a punch. Though I liked the scent, I did note a slight chemically smell after the first notes of strawberry scent. I’m not too surprised as it’s hard to capture the smell of real fruit when it comes to bath items. The Verdict: Fresh Picked Strawberries is a great scent for those who love fruit scents. I liked this hand soap, but I don’t know if I would pick it up again only because there are so many other scents I love and B&BW is always putting out new ones. It’s not the fault of Fresh Picked Strawberries it did almost everything right, I’m just not a huge fan of fruit scents. But if you dig fruity goodness, you will love this one! Bath & Body Works Japanese Cherry Blossom has been around since dinosaurs roamed the earth. It’s true, check the history books. With all of the fragrances that B&BW has been letting go lately, I was surprised to see this one still holding on. I’m not complaining, it’s one of my faves. So after the shopping extravaganza this July, it was finally time to dig into the Japanese Cherry Blossom body lotion once again. The Scent: Japanese Cherry Blossom is a combination of Asian Pear, Kyoto Rose, Mimosa Petals, Himalayan Cedarwood. The scent is very floral with almost what I would consider a hint of incense making it a bit stronger than some of other B&BW lotions. I tend to like stronger scents, but if you don’t, this one will probably not work for you. I’m enjoying using this one again, but I think it maybe too strong for summer so I will be putting it back on the shelf until late fall or winter. The Application: Japanese Cherry Blossom is moisturizing, but I have to be honest, I tend to like the old formula better. The new formula is fine, it just isn’t as smooth coming from the bottle as the old formula. Also, I don’t find it as creamy either. Still, it does it’s job as it does definitely moisturize, it’s a personal preference. The Verdict: I love Japanese Cherry Blossom, I really do. This is one that I always have on hand as it really is a great fall/winter scent. It’s a perfect scent for someone who doesn’t mind being a little bold with their fragrances and the scent lasts for hours. B&BW has had a real winner for years with Japanese Cherry Blossom so I don’t see it going anywhere anytime soon like other recent scents. Twice a year, I roll into Bath and and Body Works for their amazing semi annual sale. Going in, I have a list of items I want. Once I’m there, I convince myself that the list is severely lacking and pile 10 million different things into my mesh blue bag. Unfortunately, what usually ends up happening is they put certain scents on sale without the intention of ever bringing them back which stinks. They lure me in with scents, make me fall in love and then l have to say goodbye. Well this July was no different. So I would now like to honor two wonderful scents I will never get the opportunity to ever buy again. Why, just why? Seriously, I love this scent. At first, I wasn’t sure as it has a very strong, sweet scent when you first apply it, but then once it mellows out, it is just beautiful and feminine. The key notes are: French Mimosa Petals, Asian Syringa Flower, Luscious Tangerine, Tenufolia Orchid. I don’t know what half of these scents are but they make one great lotion! Okay, now this may be strange, but I swear I can smell a hint of banana in there. I know, I know, it’s strange, but I swear it’s in there! This beautiful scent has staying power and moisturizes perfectly. It was a win win! Oh, B&BW, why? Butterfly Flower you quickly became one of my favorite scents at B&BW, you will be missed. And you got rid of this scent why? A neighbor bought me a little collection of small perfumes with various floral scents for my thirteenth birthday. Of course I was very appreciative of the gift, but as a tomboy, I was a bit perplexed. That is until I tried a new scent everyday after my nightly shower. My favorite of the bunch? The Wild Honeysuckle. I wore that scent non stop even in school which was so unlike me. Well this lotion brought me to my happy place while B&BW took me away from it by discontinuing it. It’s such a beautiful fragrance and the scent lasts, making you feel as if you are walking in a fabulous spring garden. Is it a complex scent? No, but sometimes simplicity is the best thing and this fragrance proves that. Bath and Body Works, sometimes, I don’t understand your reasoning. I would go into more detail about both products, but instead I will mourn their loss instead. Farewell, me delicious friends! I finally finished the Sweet Pea moisturizer that I had been using for the past couple of weeks. I didn’t complete the entire bottle as I was tired of smelling like Play-do every night and realized it was time to move on with my life so I looked through my cupboard to try a new scent. Being summer, I figured maybe I should try a new flowery scent and reached for Carried Away by Bath & Body Works because its packaging screamed summer. I mean come on! It had blues skies, flowers and ribbon all over it! Carried Away is described as a romantic summery fragrance infused with white jasmine, raspberries and whipped vanilla, though I don’t really understand the whole whipped thing as it’s not cool whip or anything. Still, I was ready for a fresh new bath scent and was pretty excited for something new. On opening the bottle, I immediately was hit by the scent of flowers, most likely the white jasmine followed by a slight chemically scent. Interesting. You can’t really fully appreciate a scent until you wear it so after a quick shower I opened the bottle and was prepared to be Carried Away. My first thought was, “wow this is a really strong, sweet floral scent.” I couldn’t detect any of the promised hints of vanilla or raspberries, but I did get a slight hint of grapefruitwhich is odd as it is not listed on the keynotes. I am not a fan of citrus scents and I was a little concerned with this new discovery but went on about my day to give Carried Away a fair shake. About thirty minutes later I was still very aware of Carried Away as its sweetness had become very apparent. In fact, the sweetness mixed with the chemically flower scent was becoming a bit cloying, especially in the middle of a hot, humid summer. In the middle of summer you don’t want a scent that is too overpower because mixed with extreme humidity it begins to have a life of its own which is exactly what Carried Away was beginning to do. I can vouch that the fragrance lasts over five hours as I can still smell it hours after putting it on whether I want to or not. I don’t want to say that Carried Away is a bad scent, it just doesn’t really work for me. The packaging says Carried Away is inspired by the way love sweeps you off your feet. Not so much. For me it’s more reminiscent of being at Coney Island on a hot, sticky Saturday afternoon wearing a jasmine flower in your hair after being wrapped in a cotton candy bathing suit. Yeah, not quite as romantic, but definitely memorable and not necessarily in a good way. It’s possible that it just doesn’t work with my body chemistry. But if you like jasmine, raspberries, and vanilla you may really enjoy this scent. It’s not a timid fragrance, so if you want a lotion that has lasting power and packs a fragrance punch Carried Away may be for you. I may have a little OCD, but I tend to use the same fragrance until I run out. I have never been one to switch fragrances to match my mood unless it’s perfume. It’s just the way I roll. So I will be reviewing them one at a time spacing them out. Way to prolong my suspense I know. 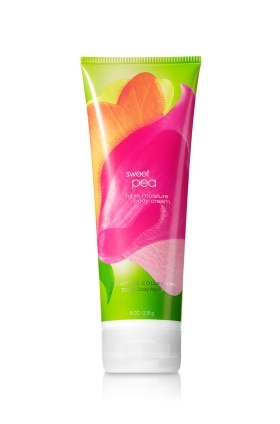 The first one I tried was the Sweet Pea lotion. The reason I started with this one was because I had some of the Sweet Pea body soap left over from the last sale, so why not pair them. I have to be honest, I didn’t like the bath gel and most likely won’t repurchase it. I’s really thick and takes a while to get into a good lather. Also, the scent is barely there and has no staying power. I think it may be best to stay with my Sabon or other frilly soaps for a while. As for the lotion, it left me a little cold. It smells alright at first, but the scent is really light and nothing special. The formula is fine and moisturizing, but the scent is just weak. After I had it on for about a half an hour, I found that it began to smell a little like Play-do on me. Maybe it’s just my chemistry, but no female wants to go around smelling like Play-do unless the scent brings back fond childhood memories or she has a crazy fetish. Sadly, I don’t really want to finish this because life is too short, but I don’t like to waste things so I am going to stick it out.